You have just spent weeks planning and conducting your survey… Now what? What do the results mean? Who do you communicate the results to and how do you share them? Using information derived from survey results can help your organisation improve employee experience and detect problems before they occur. Effective survey analysis and action plans can lead to significant return on investment. Before you get busy in analysing your data, it is important to provide survey participants with some recognition and expectations on the next steps. This will allow the employees to stay engaged in the feedback process and feel recognised for their participation. This immediate action, independent of anything else, creates a good survey experience and contributes to a positive feedback loop. Survey participation rate is the percentage of participants who have completed the survey. Participation rate helps you gauge the reliability and validity of survey results. The higher the participation rate, the better. As a rule of thumb, an 80% participation rate, can be considered representative of the population. Communication and better survey design can help you improve your participation rate. Measures employee willingness to recommend the workplace to others. It allows companies to efficiently measure employee loyalty. Employees’ answers are divided into three segments. Promoters, Passives and Detractors. The eNPS is calculated by subtracting the percentage of detractors from the percentage of promoters. Scores range from -100 to 100 and the higher the score, the better. 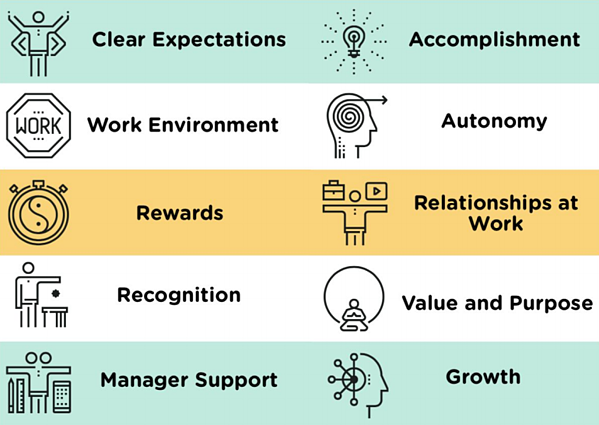 Key driver questions measure how people feel about specific aspects of the employee experience that have a significant impact on engagement. A driver analysis allow you to immediately identify what’s going right and wrong in the workplace. The analysis uses employee’s survey data to highlight improvement opportunities. Action should be taken to address identified concerns by level of priority. For example, if “clear expectation” is presented as a priority, initiate a culture of open communication is an activity that is expected to increase engagement. A driver that is shown as a strength, plays a major part in the engagement of employees. It is important to share survey results across different levels to demonstrate the company’s commitment to open communication and to help employees feel their voices matter. Managers should ideally be given full access to their teams’ aggregated results, in a comprehensive, personalised and digestible manner. Be sure to help managers understand their results and how to interpret them to guide their action plans. Managers should also understand the context/overall organisational results in order to benchmark their teams with other parts of the organisation. When sharing results with the team, managers should establish a positive and trusting environment for team members to feel comfortable to ask questions and share feedback. Raise awareness on the importance of survey results and highlight key themes of strengths and opportunities. Managers can also leverage one-on-one conversations with team members to explore results more in depth and solicit personalised feedback. Based on your opportunity areas, make specific action plans to target the engagement drivers that are deemed to be a priority. People analytics associated with employee lifecycle surveys have many benefits. It can help reduce ramp time during on-boarding, increase maximum output potential organisationally, and improve retention rates. Based on the feedback and results from your action plan, you should begin to plan your next cycle of surveys to monitor improvement and identify any changes. Download the full version or our guide "Post Survey Action Plans"